The North American Porcupine is a well-protected, plant-eating rodent that spends much of its time in trees, looking for food. These slow-moving animals have sharp, needle-like quills protecting their body. Porcupines live up to 20 years in captivity. They live in forests, deserts, and grasslands in much of North America. Their predators include the fisher (black marten), cougar, coyote, and bobcat. Quills: Sharp, barbed quills protect the back, sides, and tail; long, stiff guard hairs cover the front upper part of the body. 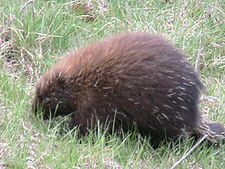 The quills are usually held flat against the porcupine's body. When the porcupine is in danger, it raises the quills upright, so they can easily lodge in an enemy when it brushes up against the porcupine. The barbs in the quills make them difficult to remove, since they point backwards. Anatomy: The North American Porcupine is about 29 inches (75 cm) long plus a short tail that is 8 inches (20 cm) long. They have a blunt snout, short legs, and long, curved claws on the feet. Like all rodents, the porcupine's front top teeth continue to grow throughout its life. It must gnaw on hard things to keep wearing the teeth down. The North American porcupine's front teeth are orange. Diet: North American Porcupines are herbivores (plant-eaters) who eat leaves, bark, evergreen needles, buds, twigs, fruit, and salt.